I had just finished painting doors in the shop/garage building and my youngest brother (almost 10) came running to the house to say that there was a hummingbird stuck in the ridge vent about 17 feet off the ground. 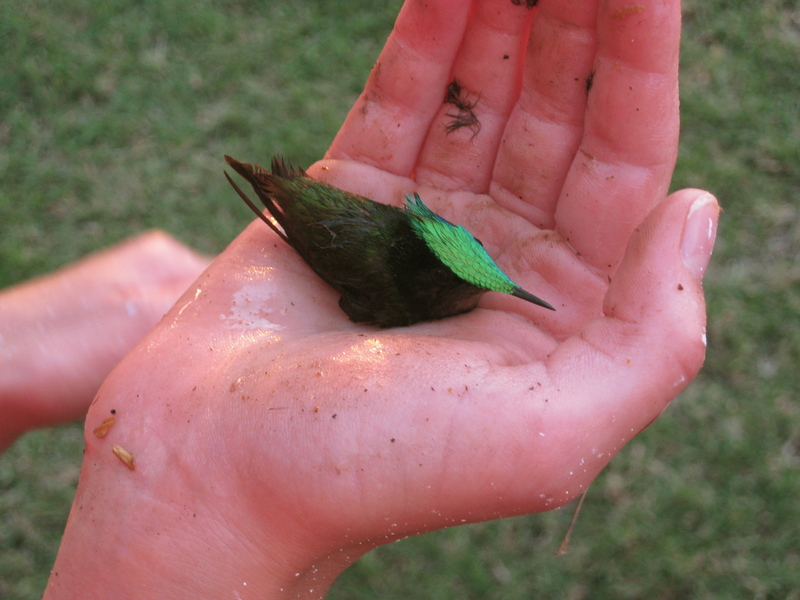 I ran back to the garage with him, climbed up an extension ladder with a rag, and reached into the ridge vent (which is about 4″ across) to stuff the rag into the vent so that there would be less room for the hummingbird to move around. 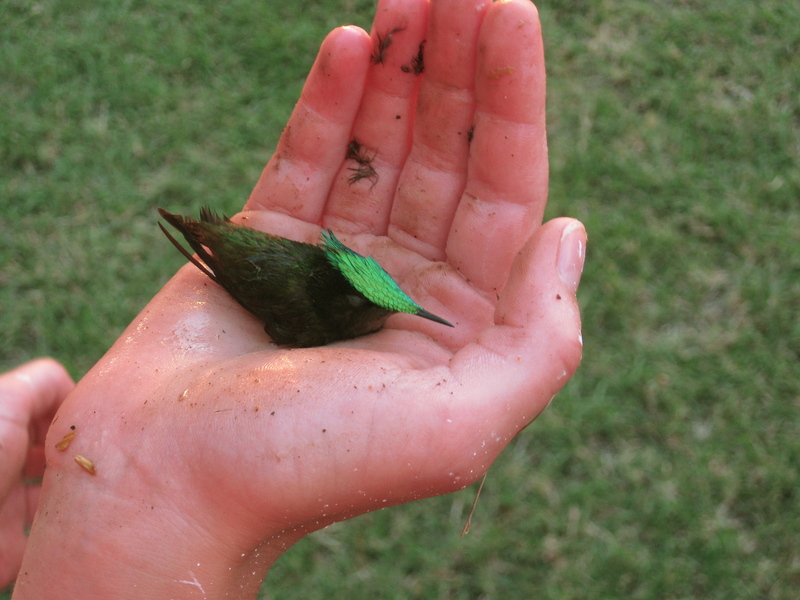 I put my hands into the vent on either side of the ridgeboard, and when the hummingbird stopped to rest, I was able to get one hand around it. Holding the bird, I carefully climbed down the ladder. You can see some of the feathers that got stuck to my hand because it was very hot up there and also I was so nervous my legs were shaking. 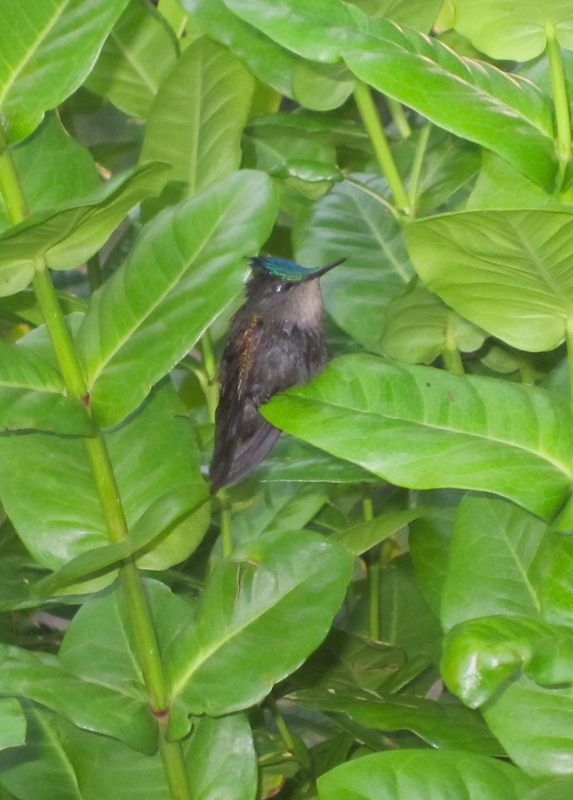 It’s a male Antillean crested hummingbird. 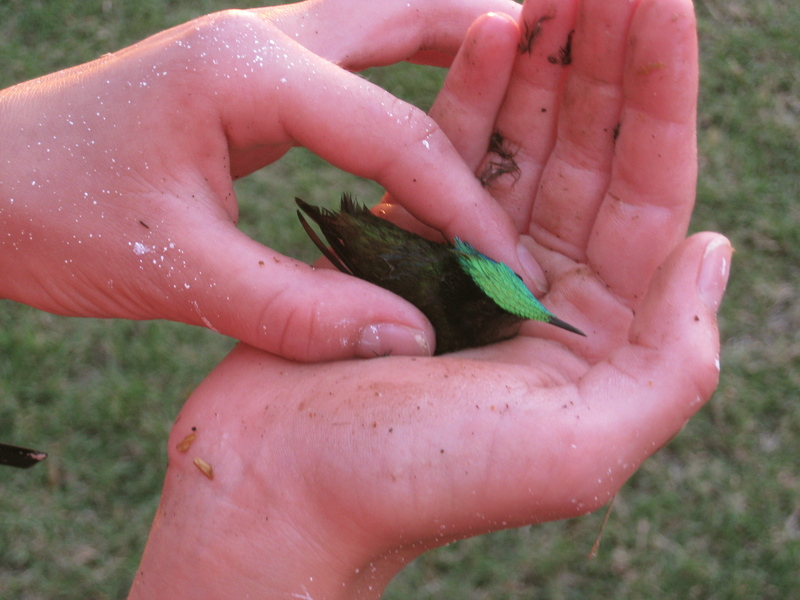 You can see some of the paint and feathers on my hand (my mother took the pictures). It rested for a while on my open hand, and then after a few minutes it flew a short distance into a nearby red ixora shrub and rested some more. 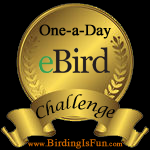 This entry was posted in General Birding, My Life List, Nevis and tagged Antillean Crested Hummingbird, Hummingbird. Bookmark the permalink. What a beautiful little hummingbird. Good thing your brother noticed and you were able to get him free. If it ever happens again try mixing a little sugar and water in the cap of a water bottle or other small reservoir and hold it up to the bird’s beak. If they don’t move they go into torpor and sugar water is a good way to give them an energy boost. Hopefull it won’t happen again! Thanks for that great idea, yes I hope that doesn’t happen again. It’s so hard on their bodies.